Managing what we eat is an important part of weight loss, but it is easier said than done! This is no longer the case! 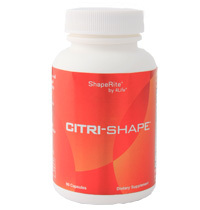 Citri-Shape helps control your appetite by utilizing a fruit extract from Asia called garcinia cambogia. The active ingredient in Garcinia cambogia, hydroxycitric acid ([-] HCA), has been shown to inhibit the production of fatty acids in the liver and help suppress the appetite. It also promotes the burning of body fat as fuel, making it a powerful aid in weight management. has been shown to inhibit the production of fatty acids in the liver and help suppress the appetite. Hydroxycitric acid also promotes the burning of body fat as fuel, making it a powerful aid in weight management. Chromium helps control appetite by aiding in proper glucose maintenance and balance, stabilizing food cravings. B-vitamins are included to help support healthy energy levels within the body.